There’s no way around it – the future of Digital Marketing is Personalization. By presenting your online audiences with relevant, personalized content in real time, you can create engaging experiences that increase conversion rates by as much as 300%. Offering each potential buyer a unique, personalized website experience will give them a reason to go from passive browser to a loyal customer and brand advocate. 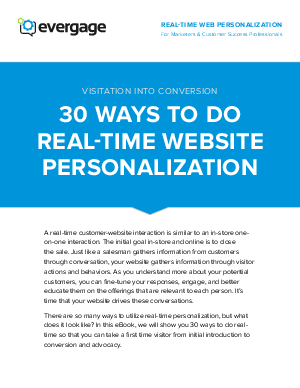 Download the free eBook, 30 Ways to do Real-Time Website Personalization, and start improving visitor engagement, driving more conversions and increasing customer retention today!